Teaism is a self described collection of Asian inspired tea houses fused with American informality.It is a response to the over-formalized Asian and English tea ceremonies, and wholly invites casualness and a true love of tea without the severe style or pretentiousness of traditional formalities. The cuisine pulls from Japan, Thailand and India, such as menu appearances of tea cured salmon, naan and raita and Thai chicken curry. So far, the salmon bento box is my favorite. 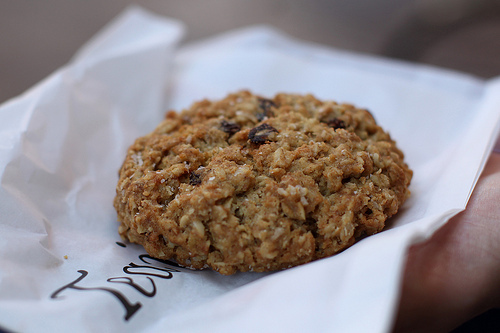 And of course, there is a special appearance by America with the original salty oat, chocolate salty oat and pecan chocolate chunk salty oat cookie- rumored to be the best cookies in D.C. I buy one every time and always send out of towners home with some. And the tea itself. The savory Golden Monkey, which reminds me of roasted dandelion tea, has always been a consistent favorite of mine, although when it is hot outside, I go for eternal refills of Moroccan mint. Green teas include bi luo chun, Dragon Well, jasmine, Moroccan mint and Thai Nguyen, while blacks include assam, chai, Earl Grey, Golden Monkey, Guranese and Yunnan gold. The bai mu dan, a white tea, is a perfect winter-to-spring transitional tea. The oolongs- anxi, baihao, formosa and tie guanyin- and tisanes-berry beauty, French verveine, ginger zing, Mind & Body, Now & Zen and World Peace- are excellent for a rejuvenation kick. The brick and mortar of Teaism itself, especially it’s Dupont location, is calming, if a little rough around the edges. The walls, stairs and posts are a beaten yet charming wood and every effort is made to use natural light. The Penn Quarter location has a koi fish pond filled with fat, gaping fish. It’s an inviting atmosphere, an accepting atmosphere, where people can enjoy tea and food without having to really know anything about it.